Oh goodness. 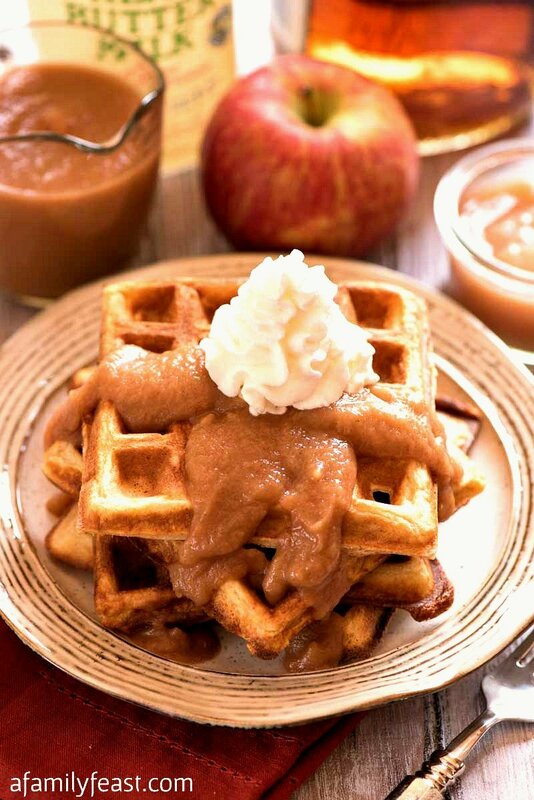 I’m sitting here writing this blog post, and I am literally salivating as I stare at the photos of these Apple Buttermilk Waffles with Apple Bourbon Sauce. And with apple-picking season in full swing – these Apple Buttermilk Waffles with Apple Bourbon Sauce will be THE breakfast of the season! A batter made with pastry and cake flour helps keep these waffles light and crispy as they cook in the waffle iron. Shredded Fuji apples (or other hard baking apples) add sweetness and delicious apple flavor, while buttermilk and yogurt lend a wonderful tender, soft texture plus a little bit of tangy flavor. 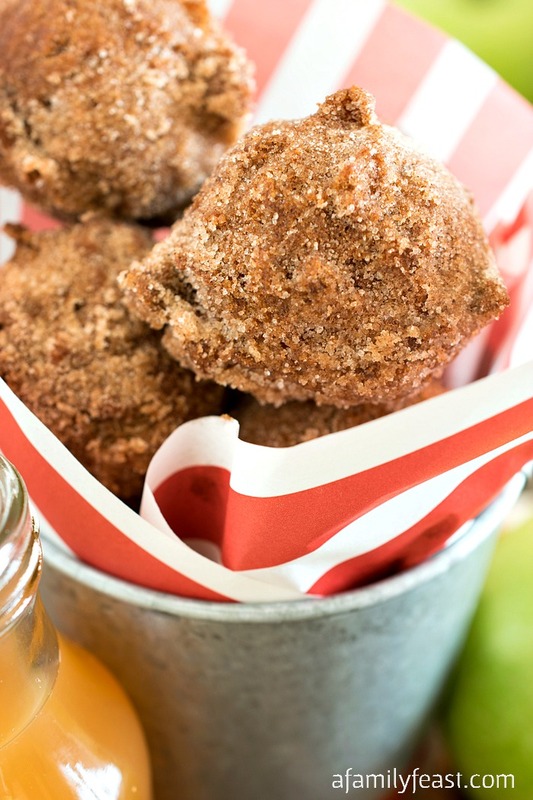 You’ll also love the mix of cinnamon, ginger and nutmeg – spices that go wonderfully with the apples. We mixed bourbon, apple sauce, brown sugar, butter, cinnamon and nutmeg together to make a decadent, luscious apple bourbon sauce that I wanted to eat with a spoon! Don’t worry – the alcohol in the bourbon cooks off as it simmers in the sauce pan. You’ll be left with a rich, buttery, sweet and spicy sauce that is wonderful spooned over the crispy waffles. 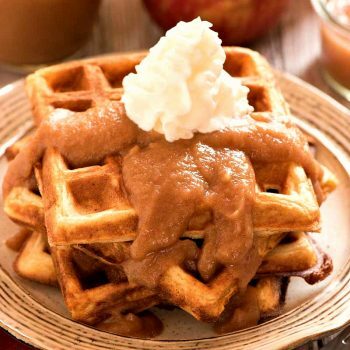 Finally, we topped our Apple Buttermilk Waffles with Apple Bourbon Sauce with a dollop of whipped cream. And while adding the whipped cream is optional – it is the perfect finishing touch to this decadent breakfast. 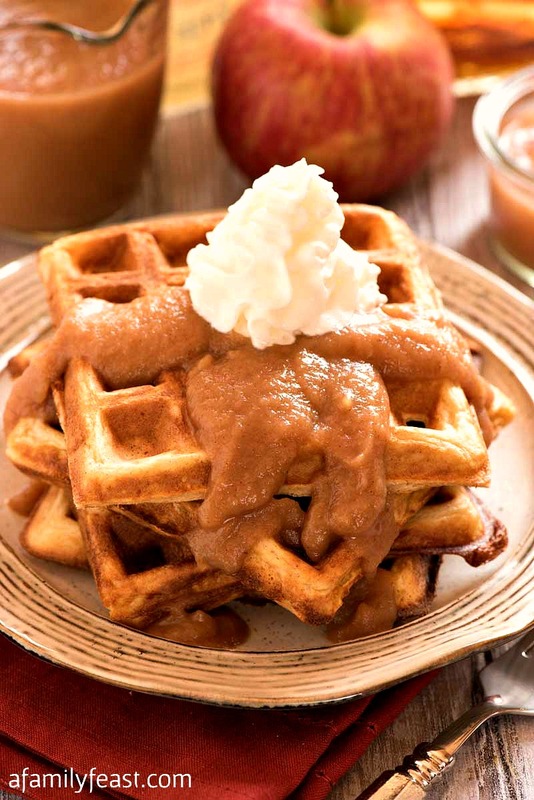 This recipe makes enough Apple Buttermilk Waffles with Apple Bourbon Sauce to feed a hungry crowd at your weekend brunch. The waffles also freeze and reheat nicely if you have any leftovers. Place all of the sauce ingredients in a medium sauce pan and bring to a boil. Reduce to a simmer and simmer uncovered for 15 minutes. Remove from heat. In a large bowl, mix both flours, sugar, baking powder, salt, cinnamon, ginger and nutmeg and whisk to combine. In two medium bowls separate eggs. In the bowl with the whites, add cream of tarter and beat to soft peaks with a hand mixer. Set aside. In the bowl with the yolks, add buttermilk, yogurt, butter and vanilla and whip. Stir the shredded apples and stir. Heat Belgium waffle maker and spray top and bottom with pan spray. Stir the bowl with the apples into the dry ingredients and mix with a wooden spoon or spatula. Do not over mix, just enough to combine. Gently fold the egg whites into the mixture. When the waffle iron is hot, add two cups of batter and close the lid. 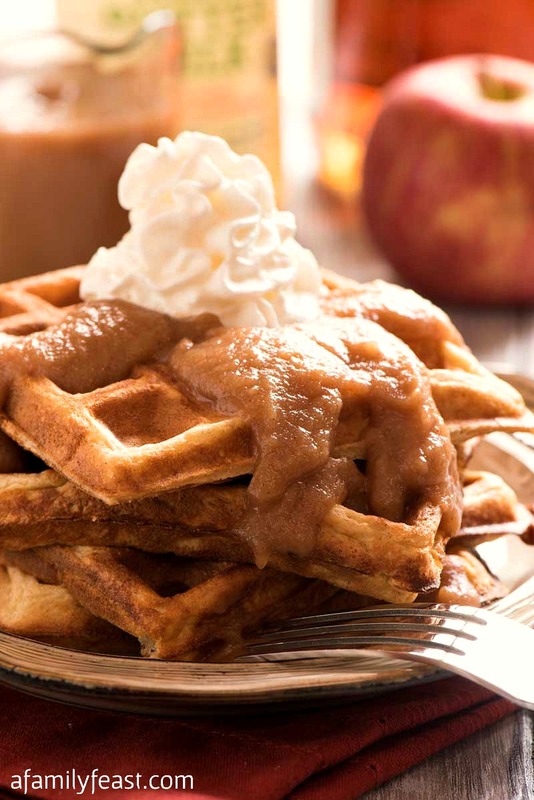 Because the apples are wet and will steam when they cook, it is important to cook the mixture a few minutes longer than the timer on the waffle iron. Ours took a total of seven minutes per batch to cook, steam and then crisp up. (OK to lift for a peak at six minutes but be careful). Ours steamed for five minutes and once the steam stopped, I let them cook for two more minutes for a total of seven minutes. Serve hot with the apple bourbon sauce spooned over the top. Garnish with a dollop of whipped cream if desired.